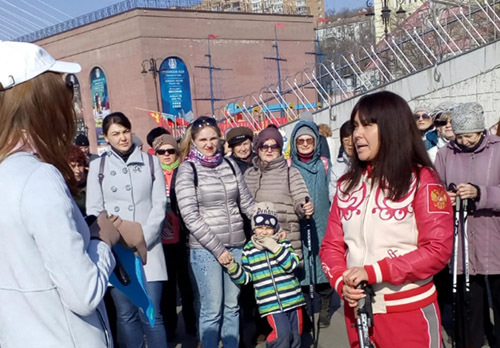 On Saturday, April 6, residents of Vladivostok went for another walk with a doctor – only the topic of classes this time was not quite standard. Laugh coach Dmitry Efimov spoke about the yoga of laughter and held a master class for the citizens- the participants "poured rainbows", "washed" resentment and, of course, laughed a lot. Day off, morning – and it seems that a walk with a doctor will be a maximum of a couple dozen people. But by 10 o'clock on the embankment of the Tsarevich is going to crowd of hundreds wishing to improve their health. The main part is the cheerful ladies of retirement age. Some even brought with them the Nordic walking poles. But you don't have to walk. Dmitry Efimov says – what is happening will resemble charging, but not quite standard and very positive. "I sometimes laugh 5 hours a day! – boasts Ambassador of yoga laughter, the official representative of Laughter Yoga International in Russia and CIS, coach Dmitry Efimov. – Maybe I'm the happiest man on earth. It's hard, but when you give – you get. Laughter yoga is a unique technique developed by a doctor of medical Sciences from India. First of all, understand, this is health gymnastics. Laughter is an act of breathing, when we actively laugh, we actively breathe." Dmitry tells participants in his lungs there is a place for 4.5 liters of air, but we breathe, usually just one. And hypoxia – lack of oxygen - leads to a number of diseases. Trainer sure – breathing exercises to do every day and cites useful exercises Strelnikova. In fact, the master class begins with it. "Remember, laughter for no reason is a tool of medicine! "– having motivated the participants, the coach starts the first exercises. First, participants are asked to simply breathe – but deeply and with several movements. The townspeople pull their hands up and to the side, combining with a deep breath and a calm exhalation. And only then pass to laughter – suddenly instead of breath the trainer starts laughing at the top of the voice. "You have a toggle switch in your head – we will now switch it from the adult mode to the child mode, because laughter yoga is a kindergarten for adults. Do together with me – chick! Now the child mode is turned on," Dmitry laughs. The first exercise is called "rainbow Cocktail". It is necessary from one hand to another "to pour a rainbow", and then "to pour", "to splash out" on neighbors and, of course, to laugh at the top of the voice. And it seems, looking at the mass of elderly participants, that they are back in childhood: laughter and joyful fuss filled the promenade. A few rainbow "drops" even appeared on the correspondent VL.ru. Then another exercise – "Matryoshka". It is necessary to present in the form of this toy complexity, which can not cope with the party. And as if sorting out this matryoshka, the person gets rid of at first more, then less serious problems, and at the end he has a very small toy over which he happily laughs.